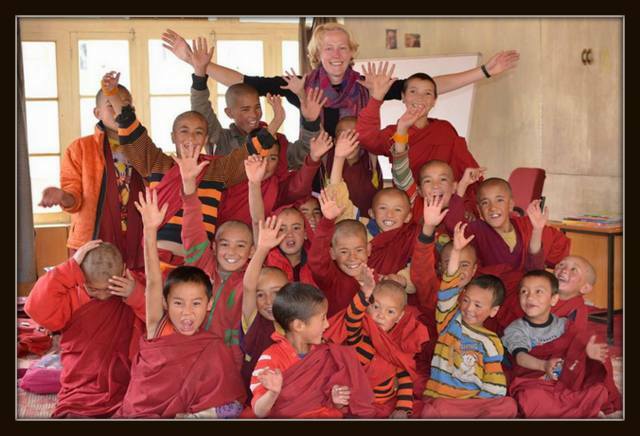 Volunter Ladakh, Mireille and students! The integrity of the culture is largely dependent upon the transmission of values, customs, and practices that have maintained this subsistence culture for hundreds of years. Children who do not live in their villages are at greater risk of losing, within a generation, their traditional way of life. Many will not know how to make wool thread and blankets, carve mane stones, know how to raise the crops and grind the barley into flour, carve the beautiful wooden lentils and door frames, make wicks for the oil lamps, bake bread on a hot stone, or a million other practices. Perhaps the greatest challenge for the sustainability of the culture in Ladakh is that many, if not most children must move away from their villages and homes in order to receive a traditionally western education. As a result, the youth often know little and value little of the traditional ways and adopt the values and practices of a consumer economy with the hopes of procuring well paid jobs. One of our chief concerns is how to best ameliorate this situation. We want to insure that the youth of Ladakh learn in a setting that reinforces the value of their heritage and place upon the land, while cultivating a positive self image. Schools are very basic and consist of a few classrooms, each containing a white board or chalkboard, a rug on the floor, and perhaps a few low tables (children and teachers sit on the floor). There are few or no books, and walls are generally bare. The traditional form of educating in India is rote memorization, at which they excel. Classes run from 10-4 (one hour lunch break), six days a week. Volunteers are needed between March 1 and into the first week in November, however the last half of June and the month of July are not available for volunteers. This is reserved for studying and exams and a two week summer break. The best times to volunteer are generally April –September when the weather is more comfortable. Most rural schools and/or residential schools depend completely on solar energy for electricity and are fortunate if they have solar heated water for bucket showers. Rooms in Ladakh are not heated. -Provide after-school activities for students living in residential (boarding) schools such as sports, environmental projects, gardening, arts, or drama. Archery, for example, is a traditional Ladakhi sport. If you enjoyed this post, please consider leaving a comment and sharing the post on with others. You can also subscribe to the mail/RSS feed to have future articles delivered to your inbox. Thanks! Kelly Klein, Leh, Ladakh, 2013. Awesome Inc. theme. Theme images by zbindere. Powered by Blogger.